Sam Spinner and Joe Colliver (orange colours) return to Ascvot today in a bid to repeat their Grade One triumph 12 months ago. JEDD O’KEEFFE hopes course form will bring out the best in Sam Spinner when his stable star lines up in today’s JLT Hurdle at Ascot. Sam Spinner won the corresponding Grade One race 12 months ago after making all under a superbly judged frontrunning ride by jockey Joe Colliver. Yet, after running with credit at the Cheltenham and Aintree festivals, the three-mile hurdler disappointed on his seasonal reappearance at Newbury three weeks ago. Owned by Caron and Paul Chapman, Sam Spinner was already well beaten when Colliver was unseated at the penultimate flight after another horse came to grief in a race won by the veteran Unowhatimeanharry who reopposes today. “The ground will be great, and obviously he loves the track – so those are positives, and we’re really happy with him,” said Leyburn-based O’Keeffe last night. “I can’t pretend I wasn’t disappointed at Newbury, not that he was beaten when he unseated Joe, more just the way he raced – there was a lack of zip, so we’re putting cheekpieces on just to create a little bit of a spark. As for the aforementioned Uknowhatimeanharry who was third last year in the colours of top owner JP McManus, trainer Harry Fry believes his horse is in better shape than 12 months ago. Meanwhile champion trainer Nicky Henderson is open-minded about Call Me Lord’s chances over three miles. 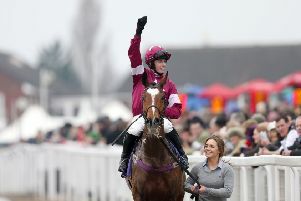 The five-year-old was hugely impressive on his final outing of last season in the two-mile-five-furlong Select Hurdle at Sandown, accounting for the admirable Lil Rockerfeller by 16 lengths. “He loves soft ground, but will he stay? Nobody knows, but you don’t know until you try it,” said Henderson who also saddles Top Notch and Soul Emotion in a wide open renewal of racing’s traditional pre-Christmas highlight.